Osijek Grand prix Croatia. Ruby Harrold and Rebecca Tunney Return to International Competition. At the British Team Championships last weekend we saw two of the quad’s strongest British senior team members return to competition after lengthy absence. We last saw The Academy’s Ruby Harrold in 2014 as part of the victorious England team who took the title at the Glasgow Commonwealth Games, as well as taking individual AA silver, and bronze in the bars final. 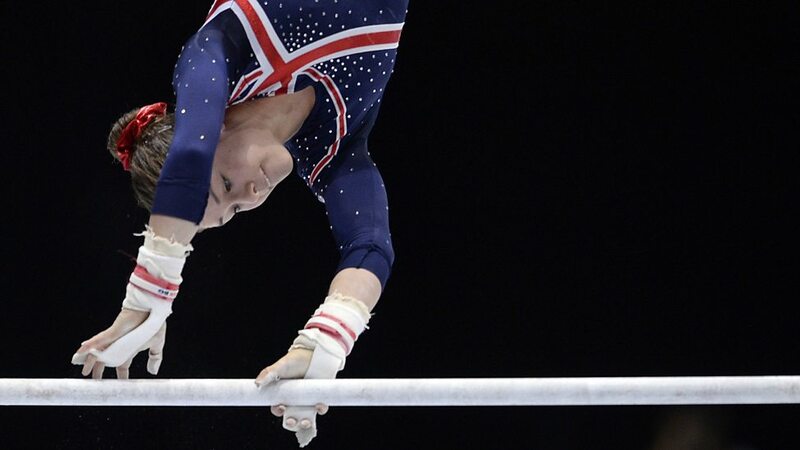 Ruby then competed at the 2014 world championships in Nanning China, where she helped the team to 6th place, finished 11th AA, and made the bars final finishing eighth. A shoulder injury kept Ruby out of the American Cup, the English and British Championships, as well as the Europeans team in 2015, so it is great to see her back competing at elite level again. Ruby traveled to Osijek Croatia to take part in the Grand Prix event competing on bars and floor. In qualifying, floor didn’t quite go to plan with Ruby tweeting ‘So I decided to do a double Arabian to land on the line judge today’ . Given that she received only a 0.30 penalty, we can now safely assume for future reference that it is no worse land on the line judge than it is to land with both feet out, and also there may be an opportunity to take the flag out with you and stop it being raised 😉 . 5.5 D score and 6.850 E score meant 12.050 was not enough for a place in finals on this occasion. On bars Ruby hit her routine for 6.3 D, 7.90 E and qualified to the final in first place with 14.20, 0.70 ahead of her nearest competitor. In the final Ruby hit her difficult and original routine again, Maloney to Bhardwaj (the Bhardwaj came in close, but with no break the flow of her routine) Van Leeuwen to Zuchold straight in to toe on full, Jaeger, and double front dismount. There is still work to do on the E score, a couple of short casts, leg separations on transitions, and a very late turn on the toe full, but nothing that can’t be worked on. Given that Ruby didn’t compete bars last weekend, it was a very impressive return for her first competitive performance. Rebecca Tunney has been absent from competition since her excellent start to 2014 where she took the senior British AA title as well as the bars title, then was part of the silver medal winning team at the 2014 European championships, and just missed out on the bronze medal in the bar final. The 2012 Olympian who was on every major team from the Olympics onward, has spent the second half of 2014 and the whole of 2015 fighting back from injury. Scheduled to compete in several competitions through the year, but having to withdraw, Rebecca finally returned last week at the British teams on floor and beam, then traveled to Croatia to contest the same two pieces. On floor Rebecca scored 12.550, the same as she scored at the second worlds trial last weekend, so an average score for her return, although she did score 12.90 on the first day of competition last week. Not quite enough for the final this time. On beam Rebecca’s first three outings have given her 13.750 (British Teams) 14.00 (Bill Slater) and then she qualified in second position for the final in Osijek with 13.80 including a 0.1 penalty. The final didn’t go quite as well, no major error or fall, but more of a dusting off the cobwebs for international finals routine for which she scored 13.20 again with the 0.1 penalty which was a time fault. 5.7 D again, but a 7.60 E which in the most part was on landings from all of her acro elements. Numbers and self belief make solid beam final performances, and Rebecca will be working on both as she aims to return as strong as ever to the international stage. Great to see both gymnasts back, with the team for world championships to be announced imminently, all performances over the weekend will have been noted and taken into account by selectors. September 21, 2015 in Competition, Reports.